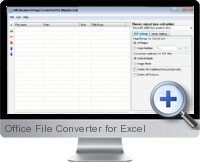 The Office File Converter (Document Image Converter Pro) is a complete solution for converting Excel and other Microsoft Office documents to between file formats for purposes of sharing, publishing and data integration. Office files can be converted in batch mode to all versions of Excel, Word and PowerPoint as well as many other commonly used file formats. Supports all versions of Excel, Word and PowerPoint including xls, xlsx, xlsm, doc, docx, docm, ppt, pptx and pptm. Supports additional file formats including pdf, rtf, txt, htm, jpg, jpeg, bmp, emf, wmf, tif, gif, png, pcx, ico, j2k, jp2 and swf. Drag and drop with fast batch conversion. Many options can be set including page selection, limiting content such as objects, compression, quality settings, resizing and merging content. Settings can be configured and saved for future conversion processes.